This is my vision of student voice: It is a place where quality teaching isn’t a person reading from a textbook verbatim , going to a counselor isn’t just because you want to change your class, and a student doesn’t have to feel like they aren’t learning because there are more than 40 people in their class. It shouldn’t be a place where we’re treated like numbers, stereotypes, and lost causes. In November of last year, CFJ and the Student Voice Campaign won a historical change to the state school funding law. Now, 6.2 million underserved students will have the chance to speak up in their schools and let administrators know what they need to succeed, and will have that input reflected in school decisions. It’s because of all of our allies, parents, donors, and supporters that we were able to make it this far. The Student Voice Campaign wouldn’t have made it to victory if it wasn’t for you. Your belief in students helped others realize the value of student voice. It’s amazing that we won all of our demands in less than a year. I remember times when I was learning about the LCAP (Local Control and Accountability Plans) or attending State Board meetings, thinking that this wasn’t something we could win. Those feelings changed after we had our May Action at the State Board of Education. In that board room we sat there, and held numbered masks over our faces. It was a representation of how students are so often seen as numbers, not people, or individuals with different needs. When we did that in the board room, the atmosphere among the board members an d the adults in the room instantly changed. But I also felt something shift inside of me. This wasn’t some random meeting where students were protesting without a purpose. This was me being a part of history. We all had a purpose in that room, we all made an impact. With all the planning, your support, ideas, and donations we ultimately shifted the mindset and perspectives of the State Board of Education. Now all 1,001 districts in California have to gather input from students to inform their budget decisions. That’s what the Rise of Student Voice is: students fighting so that our school system can be a place we actually enjoy, where we feel like we are being educated. We are more than just numbers, we are leaders in our education and in our communities. Yes we won LCFF, and now more money comes to our schools. It’s a big deal. And it has helped my school significantly. But you can throw money at something all you want, and things won’t get fixed. Why? Because in addition to more money needing to go to our schools, we need a cultural shift. We need adults to be working in partnership with students to create, establish, and sustain the 21st century education that all students deserve. 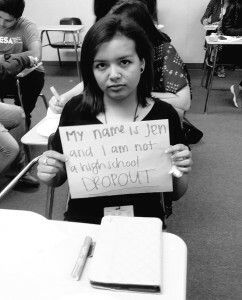 For us to d o this together, we need your help to change the perceptions of low-income youth, and youth of color. By doing this, we can, and will change policies, and practices. But we can’t do that by ourselves, we need to work together. Changing how people think about students is important to me because everyday I deal with stereotypes, the stereotypes of being a young black kid in Oakland. I’m supposed to be getting suspended on a regular basis, dropping out in 2 years, and getting ready for my first days of prison. The great thing about Californians for Justice and the Student Voice Campaign was that those weren’t the things that were expected of me. When we won a Student Advisory Committee in OUSD, and student voice in the LCFF regulations, I realized that I am more than a stereotype, a number, and that we students have so much power. Over the years we’ve asked you to donate, to attend events, and to sign petitions of support but we want you to take your commitment a little further. We want each of you to personally commit to helping me, helping all of us change how students are perceived in our schools and communities. Show your support and help us Flip the Frame! Join the campaign today. 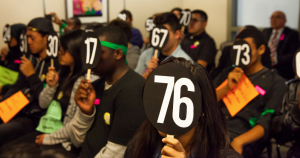 ← Students Challenge the CA State Board of Education for a Voice, and Win!